See Tuscany beyond Florence with this personalized, full-day tour of San Gimignano and Siena. Leave the navigating to your private driver and take in countryside views of hilltop towns and vineyards. 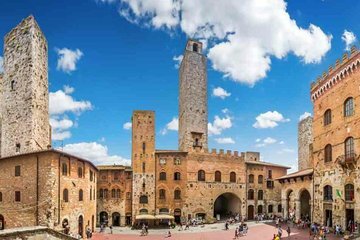 Stroll through the historic towns of San Gimignano and Siena, with free time to explore at your own pace. Before returning to Florence, stop into a local winery to learn about Sangiovese grapes and taste Chianti wine.